By default our system suggest user to use virtual keyboard. If you don't want to use virtual keyboard, please un check Use Virtual Keyboard and click ok button after reading the pop up message. To change password, click on the corresponding icon on the top-right corner. 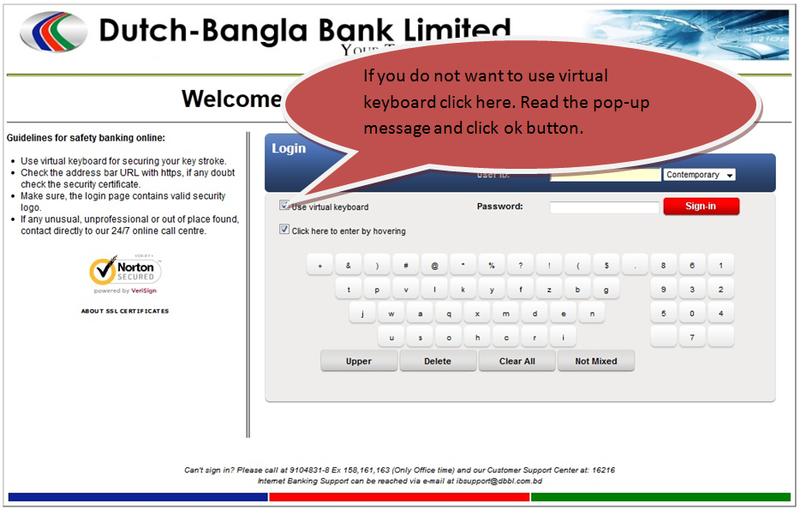 Here also if you are not interested to provide information using virtual keyboard, please un check the option of virtual keyboard. If you do not get your menu, put cursor on the left or right arrow (<<, >>). From menu click on My Payments. Then click on the with in Bank to get fund transfer option. From menu click on Bill Payments. Existing Template: If you have saved any template before then you can use that template again to do the transaction. Make New Payment: For New payment. User Reference: you can provide your own reference value. Source Account: The account to be debited. Destination Account: The account to be credited. Transfer Amount: Your desire amount. Pay now: Immediate fund transfer. Pay Later: Your desire date. Template Access Type: Only when you create a template, then need to select access type. Select Customer: Select the customer from dropdown list. Select a Biller: Only register biller will show in dropdown list. Registered number will show in dropdown list or you can enter your desire number in text box. Select Account: The account will be debited. Enter Bill No: your payable bill number or your understandable number. Bill Date: which date you pay the bill; it will come automatically. Payment Amount: Your desire amount. To pay bill you must have to register your desire biller. Register biller window will display. Click on Add New Biller. Select your desire bill payment information. If ok click on confirm button else change button.